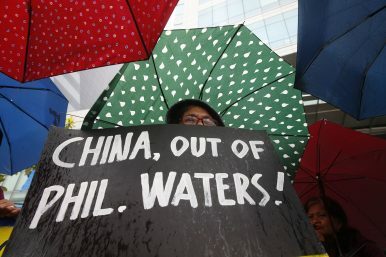 A protester displays a placard during a rally at the Chinese Consulate to protest an incident allegedly involving Chinese Coast Guard seizing fish caught by Philippine fishermen near a disputed shoal, June 12, 2018. The Philippines regards the Spratly chain of islands and islets, nine of which it occupies, in a contested region in the South China Sea as a municipality it calls Kalayaan under its western province of Palawan. That claim conflicts with the larger territorial claims of China, Vietnam, and three other governments in a long-simmering Asian dispute. “We call on concerned parties to desist from any action and activity that contravenes the ASEAN-China Declaration on the Conduct of Parties in the South China Sea as these generate tension, mistrust, and uncertainty, and threaten regional peace and stability,” the Philippine statement said. The Philippines tried to occupy the largest sandbar, about 2.5 nautical miles (4.6 kilometers) from Thitu, in 2017 but China strongly protested. Shortly after, Chinese navy, coast guard, and fishing vessels converged at the sandbars, and the Philippines halted planned construction and withdrew on the orders of President Rodrigo Duterte, Defense Secretary Delfin Lorenzana said at the time. The Philippines delivered a protest note to the Chinese Embassy in Manila on March 29. Philippine officials again raised strong concern over the Chinese vessels near Sandy Cay and Thitu, along with two other Philippine-occupied islets, in a meeting with Chinese counterparts on Wednesday in Manila, a Philippine official said. In Beijing, Chinese foreign ministry spokesperson Geng Shuang said Chinese and Philippine officials on Wednesday discussed problems in the South China Sea constructively in the latest in a series of meetings that began in 2017. “The two sides discussed the ways to handle problems with a cooperative attitude and reiterated that they will continue cooperation and discuss measures to promote trust,” he said when asked about the Philippines’ concern. Duterte has taken a nonconfrontational approach to the territorial disputes with China as he seeks trade, investment, and infrastructure funding. That apparently has not led to Beijing soft-pedaling its territorial dispute with the Philippines. Duterte has so far refused to take up with China a ruling by an international tribunal that invalidated Beijing’s sprawling claims in the South China Sea, sparking criticism from nationalist and left-wing groups, which wanted him to demand immediate Chinese compliance with the landmark decision. China did not participate in the international arbitration and has defied its ruling. By Jim Gomez for The Associated Press. Associated Press writer Christopher Bodeen in Beijing contributed to this report. South China Sea: A Chinese 'Invasion' Near the Philippines' Pag-asa Island in the Spratlys? Recent events near Pag-asa Island raise distressing questions.